Who says India and China can’t do business with each other, considering the nature of political relationship between them? Chinese Premier Wen Jiabao will be accompanied by the biggest ever business delegation when he visits New Delhi from December 15-17. The Chinese Trade Minister also will be part of his entourage. “Industrial corridors are restricted to cities like New Delhi and are seldom extended to potential cities like Amritsar due to the non-encouraging approach of the central government,” said Punjab minister for industries Manoranjan Kalia, during the inaugural day of PHD Chamber’s 5th such endeavour to organise an international trade fair, here, today. Official procurement agencies claim that paddy production has fallen by 10 percent in Punjab this year. This is contradicted by the directorate of agriculture which maintains that the arrivals are no indicator of the production. Cautioning banks against ‘money mules’ being used by criminals for money laundering and terrorist finance activities, the Reserve Bank of India has asked all banks to strictly adhere to norms, while opening new accounts, besides periodical updation of customer identification data. Faced with tight liquidity, banks have started offering high interest rate of 9.5 per cent on certificate of deposit (CD), 125 basis points more than what is offered to fixed deposit holders. Rubber goods manufacturers in the country are battling two problems. One is the spiralling prices and the second is the spectre of its shortage. Most rubber goods makers fear that if the government does not open up more import channels then after 2 -3 years, natural rubber would not be available, even at the prices dictated by domestic producers. Automobile sales continued to rise in November, even though the growth was lower than the record-setting previous four months. Data with the Society of Indian Automobile Manufacturers (SIAM), show sales grew 17.81 per cent in comparison with the same period last year. Your search for the perfect phone is now just a click away. Young entrepreneur, Sahil Bajaj, has launched a web service, PhoneCurry.com, which aims to provide the consumer with all the information needed to choose from 500 handsets. India’s exports jumped more than a quarter in November, the trade secretary said. He added a surge in the sales of cars, oil products and gems signals Asia's third-largest economy could trump its 2010-11 export target. Chinese Embassy sources here said Wen will be accompanied be more than 200 businessmen representing various sections of the Chinese industry to give a further imputes to the growing trade relations between the two countries. The sources said the Chinese businessmen would be signing some major contracts with Indian firms during their visit to India. ‘’Our business representatives are coming to India to buy Indian products while other countries have been vying with each other to sell their products to India,’’ they added. The idea was to promote the two-way trade. It is understood that the two countries are also exploring the possibility of signing some major accords in the field of trade and business during the course of Premier Wen’s visit. A tie-up in the banking sector is also a possibility. Businessmen from the two countries have been pressing their respective governments to work out an accord to mitigate the problems they suffer due to banking problems. Despite irritants in bilateral ties on the political front, both Prime Minister Manmohan Singh and Premier Wen have been strong votaries of increasing bilateral trade. In fact, Singh has time and again stated that the world has enough space to accommodate the aspirations of both India and China and that the two countries should complement each other rather than looking at each other as competitors. The Sino-Indian trade, which stood at $18.71 billion in 2005, has already crossed $49.84 billion this October. Of this, Indian exports were to the tune of some $17 billion . During his visit, Premier, Wen is expected to announce initiatives to address trade deficit between the two countries. The decision by the two countries to put complex political issues on the backburner and concentrate on enhancing the commercial relationship is perhaps a good example for Pakistan to follow. 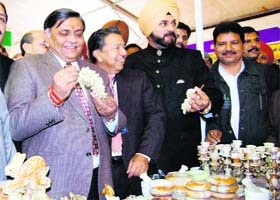 The “PITEX-2010” (Punjab international trade expo), the 5-day annual trade exhibition, is being held in Amritsar for the third consecutive time at Ranjit Avenue grounds. Manoranjan Kalia, Minister for Industry & Commerce, Punjab said that such events generate healthy competition. Eight countries are participating in this expo, which included Thailand, Finland, Holland, Ethiopia, Egypt, Canada, ASEAN countries, besides 60 exhibitors from Pakistan. The fair would generate a business of more than Rs 200 crore. Delegations from five Chambers of commerce and industry including the Lahore Chamber, Rawalpindi Chamber, Sheikhupura Chamber and Islamabad Chamber are participating. Rajiv Bali, Chairman, Punjab Committee, PHD Chamber said that Jalandhar and Ludhiana already were industrial hubs. Paddy arrivals in the mandis of Punjab are less by more than 10 lakh tonnes this year last year’s arrivals. Grain markets have received 130 lakh tones against 142 lakh tones last year. B S Sidhu, Director of Agriculture, Punjab claims paddy arrival in the market is not a real indicator of the production of paddy in the state. A number of farmers took their produce to the mandis in Haryana and sold the same there because of the problems with the rice millers in Punjab. Sidhu said that according to the latest estimates, the total fall in the paddy production in the state was not more than 4 per cent. The loss could be attributed to the heavy rains in the month of July and August and further the ban on the cultivation of PAU 201 paddy variety. Last year there was big chunk of area under paddy 201 variety which is high yielding. But the rice millers raised hue and cry over the black pin head of the grain of this variety which has not been found to be harmful by all the tests conducted by different laboratories of the Ministry of Food and Health and Family Welfare. Rather this variety has been found to be having higher iron content which is badly needed to face the malnutrition programme in the country. S S Gosal, Director Research, Punjab Agricultural University told The Tribune that during the year 2009-2010, 28.17 lakh hectares were sown under paddy out of which 4.71 hectares were under 201 variety of PAU which resulted in the additional production of 4.71 lakh tones of paddy. Had this variety been not put under ban this year, it could easily spread to about 15-20 lakh hectares. Meanwhile, rice millers have not started milling of paddy, according to official sources of the state food department. Some stock of Paddy 201 variety of last year are still pending for milling despite the fact that the food ministry has provided an incentive of Rs 200 per quintal over milling to the millers for this variety. In a circular issued to all banks, the RBI has said that: “… it has come to our notice that money mules can be used to launder the proceeds of the fraud schemes by criminals who gain illegal access to deposit accounts by recruiting third parties to act as mules…”. RBI has further cautioned that third parties may be innocent in some cases, while in others complicity might be involved. Money mule is a person whose account is being used for illegal fund transaction with or without his knowledge. In a money mule transaction, an individual with a bank account is recruited to receive cheque deposits or wire transfers and then transfer these funds to accounts held on behalf of another person or to other individuals, minus a certain commission payment. Money mules may be recruited by different methods, including spam e-mails, advertisements on genuine recruitment web sites, social networking sites, instant messaging and advertisements in newspapers. “When caught, these money mules often have their bank accounts suspended, causing inconvenience and potential financial loss, apart from facing likely legal action for being part of a fraud. Often, the address and contact details of such mules are found to be fake or not up to date, making it difficult for enforcement agencies to locate the account holder,” RBI has cautioned. The apex bank has now asked all scheduled commercial banks, financial institutions and local area banks that such mule accounts can be minimized if banks follow all guidelines under Know Your Customer norms, Anti-Money Laundering standards and Combating of Financial Terrorism, while opening an account and also to monitor all transactions in accounts so as to prevent any misuse by ‘fraudsters’. Currently, the rates of CD, an instrument generally issued by commercial banks with maturity varying between 7 days to one year, vary between 9.2-9.5 per cent depending on the banks, the treasury head of a public sector bank said. A CD bears a maturity date and a specified fixed interest rate. At the same time, 1-2 year fixed deposit rates of some leading banks currently stand at 8.25 per cent. Vinod Simon, President of the All India Rubber Industries Association (AIRIA), said that this deeper reason lay behind the outcry by rubber industrialists over the unprecedented hike in natural rubber prices this year. He was here to unfold the schedule of four-day India Rubber Expo 2011, which is to be held at Chennai from January 19-22. The function was organized by AIRIA in association with the Jalandhar Rubber Goods Manufacturers Association. The projected scarcity can well be gauzed in light of the massive expansion of tyre industry, which is expected to witness mammoth investment of Rs 17,000 crore approximately from year 2009-12, he added. “As of now, both the production and consumption of natural rubber in the country is around 9.5 lakh tonnes. Ironically, besides few small pockets, there is no region or area left in the country, which is climatically favorable for the rubber trees plantation. Now there is no alternative but to open up new import channels,” added Simon. Asked what can be the other channels, he said that besides Thailand and Indonesia, which produce 36 lakh and 27 lakh tonnes of natural rubber, respectively, countries like Vietnam, Laos and Cambodia could be a major source of natural rubber for the expanding Indian rubber industry. About India Rubber Expo 2011, he said around 350 companies across-the-world would participate and over 20,000 visitors from 60 countries are expected in the four-day fair. “Besides, China, which would participate with its 60 companies, rubber products manufacturers and buyers from United States, England, Japan, Korea, Netherlands, Germany and various South American and African countries would mark their presence in the fair, which is the Asia’s largest Expo in rubber products segment,” said BB Jyoti, President, Jalandhar Rubber Goods Manufacturers Association. The total number of vehicles sold stood at 12,21,981 units in November this year against 10,37,232 units in the same month last year. However, sales were much lower than the 45.93 per cent registered in October on year-on-year basis. The industry body expects even lower sales in December. “Automobiles sales growth in November was slower than September and October, and the actual volume was also lower,” SIAM Senior Director, Sugato Sen, told reporters. “The build-up to the festive season that gave additional volumes has tapered off,” he added. SIAM added, domestic passenger car sales jumped 20.79 per cent to 1,61,497 units in November 2010, compared with 1,33,703 units in the same month last year. Motorcycle sales grew 15.61 per cent to 7,10,182 units from 6,14,274 units. Total two wheeler sales rose 17.68 per cent to 9,30,370 units from 7,90,613 units. The industry hopes to end the fiscal year at an overall growth of 25-30 per cent. During November, commercial vehicles sales jumped 18.26 per cent to 48,314 units from 40,855 units in the year-ago period, SIAM said. Auto sales had seen record-breaking sales for four consecutive months till October with total vehicle sales at 14,60,655 units, which was better than the mark set in September this year. In November, Maruti Suzuki India posted domestic sales of 87,618 units, up 29.25 per cent from 67,786 units in the same month last year. The website does a compilation of prices, reviews, ratings, features and pros-and-cons of all major phones available in India. Bajaj added that the consumer is looking at the internet to get details of the different phones available in the market. “A recent survey by Yahoo on internet search keywords, identified ‘mobile phones’ as the third-most popular searched-for term in India, after ‘jobs’ and ‘travel’. This proves the huge potential,” said Bajaj. The user selects his feature requirements and budget. He is then presented with an initial shortlist. The user can then check out detailed information about each phone including its price, pictures, feature list, summary of pros-and-cons, and video reviews. “The phones are also given an over all ‘value-for-money’ rating. Users can also compare selected phones side-by-side. We receive an average of 2.50 lakh page reviews in a month,” he added. India can also cheer a trade deficit that has shrunk to an eight-month low of $8.9 billion in November, helped by a slower growth in oil imports, after hitting a 23-month high in August that had put pressure on its current account deficit. India's exports for the current fiscal year to end-March 2011 will probably touch $210 billion to $215 billion, compared with an earlier target of $200 billion, even though the euro zone debt crisis has started biting into the demand for Indian goods.